A honeybee colony will send scout bees to search 30 square miles for a new home. Unfortunately, bees can decide to move in too close for comfort. We work hard to rescue and relocate honeybees around Birmingham, Alabama to a better home where they can get back to being busy as a bee. Please read below to identify which type of honeybee situation you have. A bee swarm is a specific situation for honeybees, as opposed to bees that are actively living inside a building is completely separate situation requires specialized equipment. Swarms can be removed for free or a reasonable fee based on time and effort involved. Established hives with comb cost several hundred dollars and take hours of work to remove. When we speak with you, we will ask for details about where the bees are. We are not able to remove established hives in buildings right now and would recommend reaching out to your local beekeeping club. How many hours or days have you notice the bees? Are the bees going into and out of a building? Where and how high are the bees? If the bees are in a ball, what size ball are they in? Baseball, soccer ball, 2 basketballs, etc..
Has anybody disrupted the bees at all? How urgently do you need the bees removed? Is there a power source within 100' of the bees? IF YOU HAVE A SWARM OF HONEYBEES NEAR YOUR HOME OR BUSINESS, PLEASE CONTACT US QUICKLY THROUGH THIS FORM OR CALL/TEXT SO WE CAN REMOVE IT. Texting a picture to us is enormously helpful, so please send that if you can. Go to our contact us page for contact information. Swarms appear quickly and form a cluster of bees. Established hives will have honeycomb and built in a protected area. Thanks for filling our form. 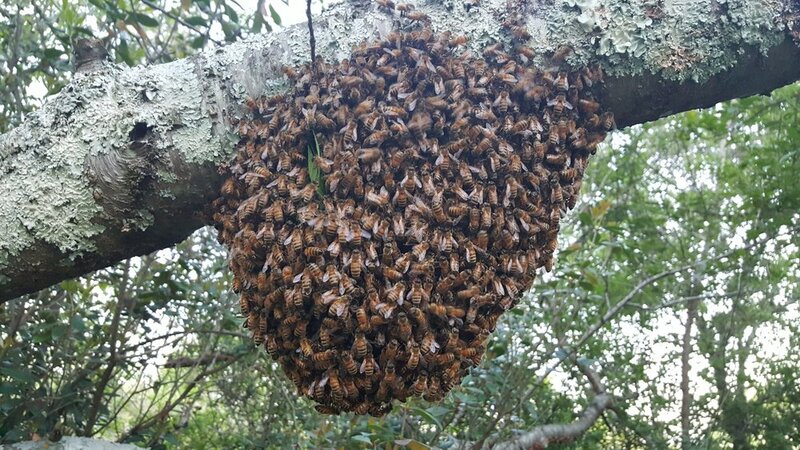 A large cluster of bees hanging in a tree can look terrifying, but honeybees are extremely gentle when doing this. A swarm is typically noticed as a cluster, rather than a group of thousands of bees in the air. A swarm of honeybees rests in a temporary home while scout bees look for a new home. It can actually take several days for scout bees to find a nearby home that will meet their standards. In the meantime, honeybees keep warm and eat honey saved up in their stomachs. While bees are swarming and are clustered together, scout bees are making daily flights to inspect cavities for a potential home. Returning scout bees make energetic "waggle dances" on the surface of the cluster to report their findings. Eventually, worker bees will democratically decide the best location option for a new home. Interestingly, the queen has no say in where they will go. Honeybees can only sting once and die quickly after stinging, sacrificing their lives for the sake of the colony. Because a honeybee will die if its stings and has no "home" to defend, a swarm of honeybees is less apt to sting and are very gentle. When the honeybees decide to move to their new home, or if they decide to start their home where they are, they can become more of a nuisance to those nearby.